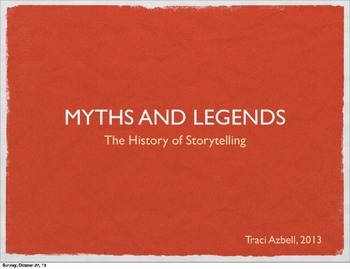 This 51-slide PowerPoint discusses the history, evolution, and influences of storytelling around the world. It covers various topics, such as the forms and purposes of storytelling, the various aspects of a society that storytelling influences, and the importance of storytellers throughout history. 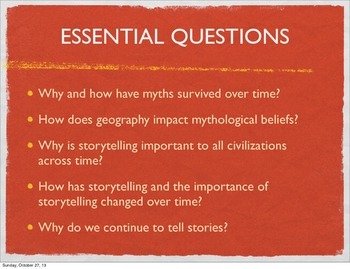 This PowerPoint also talks about the first recorded stories, beginning with the Lascaux Caves and Gilgamesh as well as common themes found throughout different stories. 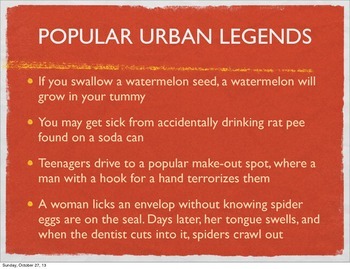 It discusses mythology, legends, and folklore as well as characteristics and examples of each. 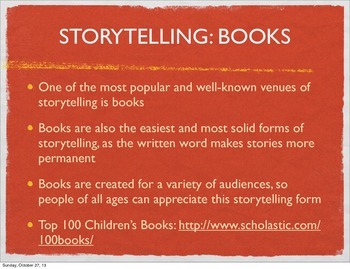 Lastly, this PowerPoint discusses storytelling and storytellers in today’s society. Looking for more material on the elements of culture? Check out the link below! The Seven Elements of Culture PowerPoint -- 18 Slides.